The Advanced 7th grade Langauge Arts and Reading class reads The Diary Anne Frank. This page is devoted to providing links that we will be utilizing throughout the reading of the book that help better understand the novel and bring an interactive approach to the reading. Newspaper in Education provides 24 news articles/chapters that corrospond beautifully with the diary and provide exceptioanl activities for students to get involved, research, and better understand Anne's story. 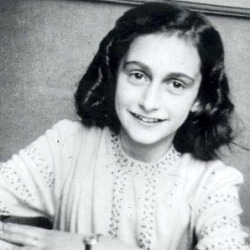 Anne Frank Guide--Gives additional information about the Holocaust, Anne Frank, the Frank family and others involved in hiding Anne and her family.